A new year has arrived, and so have new opportunities for high school students in the Winnipeg Jets Hockey Academy (WJHA). The WJHA program has created new opportunities to better prepare students for their future and assist them in transitioning into the workforce. As part of WJHA after-school programming, mentorship and tutoring components are offered to provide practical education for students’ futures that will help to alleviate numerous challenges faced by many youth. The mentorship component occurs on a bi-weekly basis for 18 weeks and is currently in nine high schools within three school divisions. The curriculum emphasizes the relationships between personal, physical, and professional development to support four major life areas: social, physical, emotional/psychological, and school/work. Two streams of programming are provided, each with their own unique learning objectives for Grades 9/10 and 11/12 students. Grade 9/10 students start to discover a sense of self-awareness in their program. This is achieved by completing individual assessments about their interests, transferable skills, knowledge, personal strengths, and values. They also have the opportunity to learn about various career options through experiential learning opportunities that include volunteer experiences, tours with WJHA Living Philanthropy partner companies, and community organization presentations. 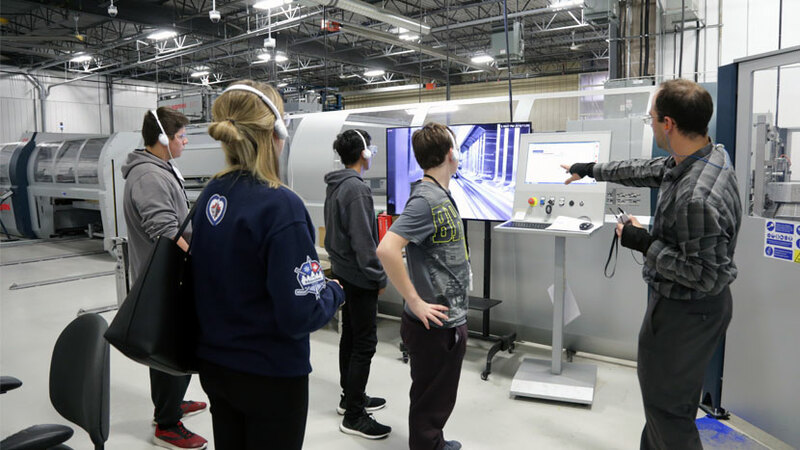 This school year, Grade 9/10 students have participated in two experiences where Price Industries and Maple Leaf Construction presented them with numerous opportunities available in the respective fields of sales and manufacturing, and construction. Students also volunteered at Winnipeg Harvest to gain work experience and give back to their own community. The next few months will feature many more opportunities for the Grade 9/10 students to grow. Students will write resumes and practice interview skills for their future job search, tour both the Manitoba Law Courts with a crown prosecutor, and the Manitoba Institute of Trades & Technology, and meet with representatives from Addictions Foundation Manitoba where they will be introduced to harm reduction strategies related to substance use and misuse. In Grades 11 and 12, the focus shifts from self-knowledge and awareness, and moves toward planning and decision-making. Students start to see the relevance from past learning by connecting to the work world and labour market realties. With adulthood around the corner, it is in this age group that students start to explore the necessary life skills to be successful as they start to make their own decisions for their future. From September to December 2018, students explored their individual work and career options and discussed methods of paying for their post-secondary education with Manitoba Student Aid. Students also attended Save on Foods to discuss nutrition and how to shop on a budget. Moving forward, Grade 11/12 students will explore social rules and etiquette, learn general car maintenance with CAA, and learn to develop healthy coping strategies when managing stress. The mentoring component is a major aspect of the WJHA’s after-school program, but equally important is the fundamental need for academic support among WJHA students. If students are not able to graduate high school, they are unable to achieve the future career goals they have developed. Currently, 57 WJHA students receive weekly tutoring from WJHA full-time and part-time staff to support students in graduating on time and with their peers. Over the next few years, the WJHA aspires to have resources to support all WJHA students who are below 60 percent in all of their compulsory courses. As the WJHA high school student population nearly doubles to 400 students in 2020-21, the WJHA is looking forward to continually expanding the opportunities it can provide to students so that they too can make a difference within the Winnipeg community.